You know when you are walking alone outside and your mind begins to smack you in the face with all that has happened up until this point. Good and bad all of it just right there in front of you. Your head gets heavy and the weight of it all just brings tears to your eyes. Not knowing you crying. tears just stream down your face and you are in the moment. All of the sudden as you are wiping tears from your cheeks, not knowing when they began to fall or how, you see a familiar face that makes that moment just break. The smile and kind words just bring comfort to anything you were feeling. The heaviness just slowly lifts and you are back to the present. You appreciate the smiles and words and take it in to remember what a beautiful gift you have. It’s life. It’s love. It’s family. It’s friendship. Keep the faith and hope alive. Enjoy your Friday! The kids are calmly playing in the kitchen until I hear some loud noises. I begin to make my way in that direction and hear Isa yelling at Gio then she calls him a baby aggressively. I was just about to walk in there and immediately let Isannah know that we do not talk to people in that manner but something stopped me. I think the expression on Gio’s face made me just stop, pull back and listen from a distance. As I began to listen and see what was going on I noticed they were reenacting scenes from Yes, Virginia there is a Santa Claus. It was the part where the mean girl “Charlotte” was calling Virginia names and pulled a special Christmas book she made out of her hands and threw it to the ground. Charlotte then called Virginia a baby stating there was NO Santa. Giovanni and Isannah said and did everything the way it was played in the movie without missing a beat. The expressions on their faces were exactly the way they needed to be in each roll they played. After it was over the other would say it was their turn, and then they started up all over again. From pulling and slamming the book, to the sad faces and mean words. It was as though I was watching my very own show starring Giovanni and Isannah as Charlotte and Virginia. I couldn’t help but smile the entire time. Then after about 3 times each they began to giggle and hug each other. It was the most amazing thing to watch. How can these two kids already know all the emotions and show them so clearly? The love and kindness floating around the room filled my heart with so much hope. It’s moments like these that no matter the hard times you experience this brings you back to a hope that things are truly good and we just need to open our eyes to it. Faith that love conquers all, and trust that you are right where you need to be. I have two little teachers in my life that remind me every day how great life is and how much we should appreciate every moment. What better reminders than children. 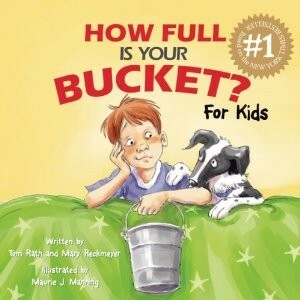 I can’t help but smile and maybe shed a tear every time I read “How full is your bucket” to my kids. No matter how many times a day I read it, the reaction on the kids face makes my entire body smile. It also makes me think of every persons invisible bucket and try to be cautious and caring with my words. My wish for all of you is that your bucket stays full for all your days. We decided to treat the kids with a movie on the TV. It’s a HUGE treat as they only watch TV during breakfast in the morning. I thought I would play Yes, Virginia There is a Santa Claus. Once I turned it on they sat so quietly. Their eyes glued to the screen with concern and then happiness throughout the movie. As soon as the movie was over, Giovanni immediately came over to me and said, “that was nice mommy.” He had the softest sweetest look on his face. He understood exactly what it was about. Right when I was about to cry I heard clapping. I turned to see Isannah clapping at the TV. These two truly have my heart.